It is very important to know the rules of the game you are playing in order to fully enjoy your casino experience. One of the most important things you should know in order to be able to play video poker is the rank of hands that can bring you a win. For those who are fans of traditional poker, there will be no issue learning the winning hands of video poker. Even if you are not used to the casino game, you will be able to learn the typical hands and their ranks in no time. With some practice, you will be able to play the game and enjoy your time to the fullest. Since there are many variants of the game, it is possible to have the winning hands form in a special way. This is why it is good to learn the hands ranking for the various video poker options. This way, you will always be prepared with the right type of strategy and a gameplan. Knowing just the way hands are formed is not enough since different video poker games award the biggest win for different hands. This is why it worth spending some time getting familiar with the winning combinations of various video poker games. As soon as you learn the hands you can make in video poker and what payout they award, you will be ready to embark on fruitful and fun gambling adventures. To make everything easier for you, we have taken a detailed look at the different video poker hands and their place on the paytables. While there might be slight differences in the highest-paying hands on various video poker games, there are several hands which are typical for every variation of the game. The highest-ranking hand in video poker is Royal Flush. It is a 5-card combination of 10-J-Q-K-A of the same suit. You may find some variations of the game which offer 200 or even 300 times the size of your bet. If you play a standard game of Jacks or Better, the typical payout for Royal Flush will be 250 to 1. It should also be noted that most video poker games offer players a jackpot for landing a Royal Flush. This, however, applies only to those who are making a maximum bet. Royal Flush is a key hand for players who are often chasing progressive jackpots. Video poker machines often will reward the first player who gets this hand with a generous progressive prize. 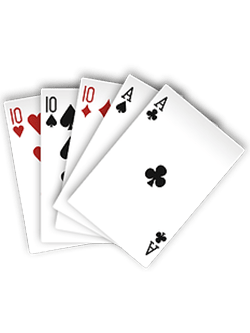 This being said, the one condition that applies almost always is that the hand must be formed on the first draw and not after the player has discarded some of his/her cards. 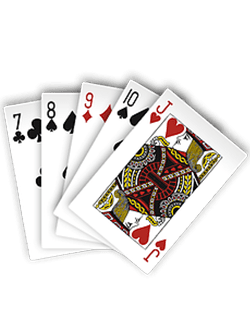 In addition to this rule, you may also find that some games will reward the jackpot only if the cards that form Royal Flush are in consecutive order, i.e. 10-J-Q-K-A or A-K-Q-J-10. Although the payouts for this hand sound very tempting it should be noted that the odds of getting Royal Flush on your first dealing are 1 in every 649,740 hands, meaning one should be extremely lucky to win the progressive jackpot. This being said, thanks to the second draw that video poker players have, the chances of landing this hand increase. The hand that follows up the great payout for Royal Flush is Straight Flush. 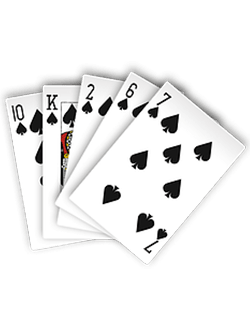 It is yet again formed of 5 consecutive cards which should be of the same suit, with the exception of 10-J-Q-K-A as this is Royal Flush. When taking a look at the paytables of different video poker variations, you will notice that the payout for this hand usually goes around 40 to 60 times your original bet. If you are playing standard Jacks or Better, the payout for Straight Flush will be 50 to 1. The odds of hitting Straight Flush on your first draw are estimated to be 1 in 72,000 hands but thankfully, these odds increase as we add the second draw. Like the name of this hand suggests, it is formed by four cards which are of the same value. For instance, if you have formed a hand that looks like 10-10-10-10-4, then you have Four of a Kind. Generally speaking, the payout for this hand varies between 20 and 30 times the amount you have staked. The typical Jacks or Better video poker offers a payout of 25x for having Four of a Kind. While the odds of having Four of a Kind on your first draw are 1 in 4,000, you can improve your chances when there is a second draw. If you decide to play Deuces Wild, there is actually an especially great payout if you form Four of a Kind with deuces. This special hand will reward 200 times your stake which is a great advantage for fans of the game. Ranking fourth among the best-paying hands in video poker, we have Full House. This hand is formed of 3 cards of the same value and 2 cards of another. If you, for example, draw 4-4-4-7-7, then you will enjoy the payout for Full House. Usually, you might enjoy a win ranging between 5 and 9 times your stake for having this hand on video poker. If we take a look at a full-pay Jacks or Better, we will see a payout of 9 to 1 for Full House. This is actually one of the payouts you should check when you wish to know whether the variant of Jacks or Better you are playing offers the highest possible payout. If you are wondering what are the chances to have Full House on the first draw, the odds have been estimated to be 1 in 700 hands. Of course, yet again, the second draw affects the odds in favor of the players. When you play video poker, you will have Flush ranking as the fifth hand at the paytable. It is formed of five non-consecutive cards which are of the same suit. Let us say that you have drawn 3-4-7-9-J of hearts, then you will be paid for Flush. This is the other hands you should check when seeking a full-pay version of Jacks or Better. The best payout you can receive on Jacks or Better for having a Flush is 6 to 1. However, there are often options which offer a payout of 5 times your stake. Landing Flush on your initial draw is estimated to happen once in 500 hands but with the second draw, your chances of forming the hand improve. The next hand that will bring you a win on video poker is Straight. It is formed by 5 consecutive cards which, however, are not suited. This would mean that, for example, a hand which looks like 4-5-6-7-8 is considered Straight as long as the cards are not of the same suit. The typical payout for this hands is either 3 to 1 or 4 to 1. If you decide to play Jacks or Better, the payout will be 4 times your stake for making Straight. The chances to land Straight on your first draw are 1 in 256 hands and adding the second draw further improves these odds. You will also enjoy a payout for having Three of a Kind which is exactly what you would imagine. 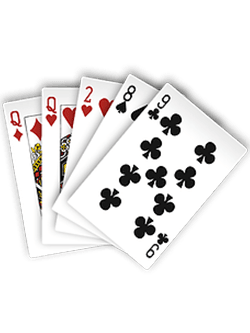 If you have three cards of the same value in your hands, then you have successfully made this hand. If you, for example, have acquired a hand that looks like 7-7-7-Q-10, then you will be paid for Three of a Kind. This type of hand usually will pay out 3 times your initial bet on a variety of video poker options. The odds of landing Three of a Kind is 1 in 50 hands and with the second draw, your chances become even better. Keep in mind that if the other two cards in the hand are a pair, this would actually be Full House and not Three of a Kind. The next hand that will bring you a reward when playing video poker is known as Two Pair. You can enjoy a payout whenever you have two different pairs in your hand. For instance, if you have made a hand consisting of A-A-10-10-4, then you will enjoy a Two Pair win. If you manage to form Two Pair, then you are usually paid 2 times your original bet. This applies to Jacks or Better, as well as other variations of video poker. The chances of landing a hand with two pairs on your initial deal are estimated at 1 in every 20 hands. With the second draw in video poker games, these chances are even higher. Among the hand ranks that will bring you a payout, the last one is Pair. 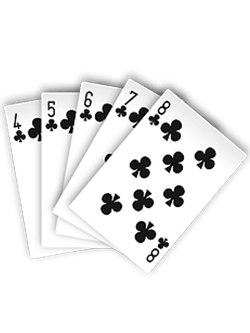 If you do not have any of the aforementioned hands but you still managed to get two cards of the same denomination, then you will be paid for Pair. The payout for this hand is only 1x which means that you will simply get your stake back. It should be noted, however, that not all pairs will guarantee a payout. In most cases, you have to make a pair of Jacks or a higher denomination when playing most video poker variations. For those who play Tens or Better, the lowest value of the pair that will pay out is two 10s. The odds of getting Pair on the first draw are estimated to be 1 in 2.381 and they get better with your second draw of cards on video poker. In addition to the typical video poker games, there have been many variants with wild cards introduced to casino fans. Just as it is with the majority of video slots, when playing video poker with wildcards, you have the opportunity to replace any card from the deck with the wild one. It will substitute any suit and any denomination in order to help you form a winning hand. 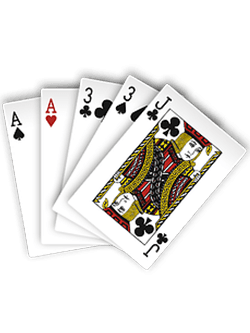 If you, for example, choose to play Deuces Wild and your hand is 7-2-5-5-5, you will enjoy a payout for Four of a Kind, instead of for Three of a Kind. Thanks to the 2, which will act as a fourth 5-card, you can enjoy a better payout. The endless variety of video poker games with wild cards that can be played at online casinos give players plenty of opportunities for lucrative gambling. 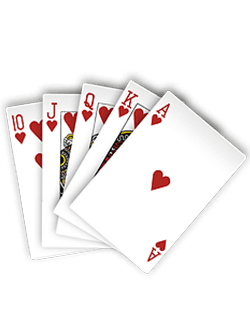 Among the titles you can often play online, you will find Joker Poker which has one Joker card in the deck that acts as a wild. With Double Joker Poker, the wild Jokers become two, while Deuces Wild have all four deuces act as wild cards. Bonus Deuces Wild, on the other hand, will reward a special reward of 1,000 coins for having Four of a Kind with four deuces. There is even a better reward of 2,000 coins of the fifth card is an Ace. These are just a few of the video poker options with wild cards you can often find online. When video poker machines were first created, it was possible to bet only on one hand. However, at the beginning of 21st century, the video poker machine which was created by Ernie Moody demonstrated the feature to bet on multiple hands. Thanks to the new addition to the casino industry, fans of video poker had the opportunity to bet on as many as 100 hands. Nowadays, many virtual casinos also offer many of their video poker games in several variants with a different number of hands you can bet on. When you decide to play multi-hand video poker, you will see the main hand on the bottom of the playscreen and the rest of the hands will be above it. Meanwhile, you will be able to choose on how many hands to make your bet on. While the cards will be identical for all hands on the first draw, once you decide which cards to hold and which one to discard, the new draw will deal different cards to each hand. Thanks to this option, players can maximize their potential profit and enjoy a very fruitful experience. As it was mentioned earlier, some video poker variants will offer players the chance to bet on up to 100 hands. This is why you may not always be able to see the other hands displayed above the main one. However, the game will always detect if there is a winning combination which should be paid out to players. Some video poker machines will also offer the option to make a double-or-nothing type of bet whenever they make a winning hand. Even though the winning hands are almost identical for all video poker variants, there are some differences when it comes to which hands offer the highest payouts. This is especially true for the games that have wild cards. We have listed the paytables for various video poker games, starting from the highest-paying to the least-paying hands.